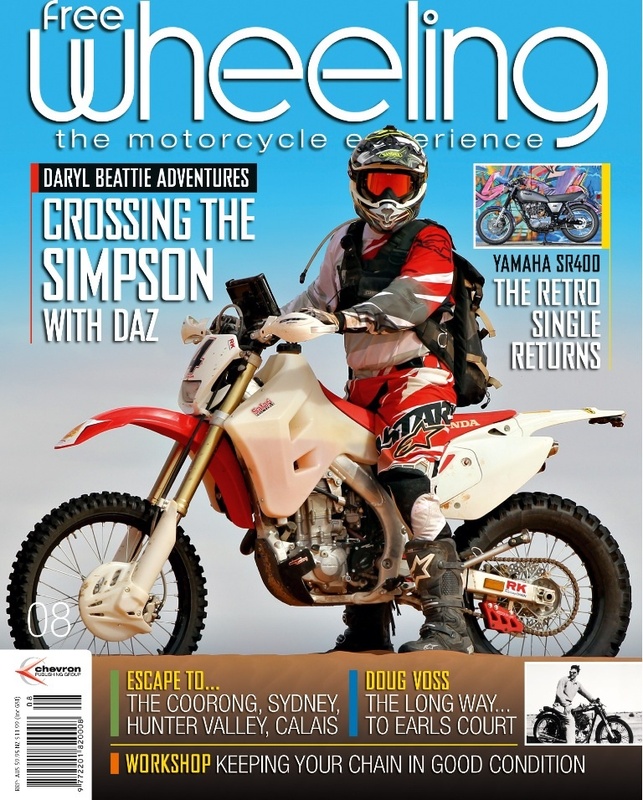 This article appears in Issue 8 (July-August 2014) of Free Wheeling Magazine (Australia). Based on two previous posts, it aims to offer inspiration to those who feel the call to set off on a big trip, but haven’t yet made the commitment to go. Even to a non-rider, the idea of a long journey on a motorbike is something that evokes a sense of excitement. There is something romantic about riding across wide open plains, living out of your panniers and camping by the road. Anyone who has watched the iconic road trip movie ‘Easy Rider’ will know what I am talking about. For the motorcyclist, the call of the open road through foreign lands can sometimes prove irresistible. Yet many who feel that call hold back and don’t take the jump. I have met many riders during my 18 months on the roads of South America, some young and fresh out of college, others enjoying their retirement. For them, either at the start or the end of their working lives, I suspect the decision to ride was a fairly straightforward one. But for those who fall into the same category as me – at a crossroads, undergoing the classic mid-life crisis – the decision can be a difficult one. For us, it feels like more is at stake, notably careers and financial security. And perhaps there is something deeper that also holds us back. Giving it all up and hitting the road can mean stepping out of a comfortable and structured lifestyle which provides us with a sense of personal identity and purpose. For those who have spent many years immersed in a career, letting go of this sense of identity and purpose can be very tough. I chose to travel after deciding at short notice to give up a successful 18-year career in the Army when all those around me thought I would go on to greater things. I didn’t know what I wanted to do next, but I did know that I needed some time to recalibrate and reset the dials after so long in the military. I could see the constraints that such a structured lifestyle had placed upon me, in which I always had a goal and a sense of needing to prove myself. If you are not careful, you can easily lose yourself in such a lifestyle, caught up in the current and not seeing the riverbanks pass rapidly by. I knew I needed to take time out, let go of the reins a little and take stock of where life had delivered me thus far. Of course, everyone’s personal circumstances are different. However, based on both my own experience and those of others I’ve met in similar situations, I recognise that stepping into the unknown and leaving the familiar behind can be a daunting prospect, even if the call to travel is strong. But why is it daunting? I’ve reflected a lot on this and I keep coming back to the same, rather absurd conclusion – it is basically a fear of freedom. Removing the shackles of a routine life – the patterns you have developed that can become set in stone; the expectations of others around you which you feel obliged to fulfil; the ‘needs and musts’ of daily life such as covering the bills – opens the doors to freedom. Life on the road – with your entire home packed in your panniers or the back of the car, where you are anonymous and where the course of daily events simply cannot be fully predicted and controlled – magnifies that freedom. For me, travelling for an extended period of time has been a profound experience. It has given me the time and more importantly the space to step back and look around, to see things differently, to reflect on what is important to me. I’ve changed my views on certain aspects of life, things I used to think were important have been put more into perspective, and some of my aspirations in life have shifted. Travel – exposure to foreign cultures and different ways of living – makes this process both easy and inevitable; you simply cannot hold on to all your old ideas when everything around you is unfamiliar and sometimes very different. Life on the road is the perfect tonic for a control freak. Events are unpredictable and, to a degree, out of your hands. You have to learn to go with the flow. I learnt this early in my trip, when a broken transmission led to a six week wait as parts were sent from UK. Everything is fluid: roads become blocked by landslides or protestors; things get lost, stolen or broken; borders close unexpectedly; your trusted GPS takes you down the wrong road, or the apparently correct road abruptly ends in the middle of nowhere after 100km. All of these have happened to me. Back at home, in our structured routines, such events would be seen as unwelcome obstacles, sources of frustration. On the road, they are blessings: they shape the adventure; they teach you to be flexible, tolerant and embrace the unexpected; and they put other so-called ‘problems’ into perspective. Travelling on a motorbike, rather than by car, bus or even four-by-four, amplifies this experience significantly. On a moto, the traveller is in direct contact with the world around him. Riding through a village the locals can see you, and even hear you as you shout a ‘hello” as you pass – whereas in a car you are invisible inside an impersonal metal box. You can pull up beside the road almost anywhere at a moment’s notice to seize an fleeting opportunity. On a decent adventure bike, you can access remote places, savouring the freedom of a high, lonely mountain pass, or an isolated campsite in the desert. There is an inherent simplicity to life on a moto; you can only carry the essentials in your panniers and every item has a purpose. Surrounding yourself with all that clutter which we accumulate in life and deem to be so important simply isn’t an option – and that is very liberating. I’ve been on the road for 18 months, but a ‘big trip’ doesn’t need to be that long. I’m taking it slow; other riders have completed the same distance in a quarter of the time. And I am doing this trip having reached a major personal crossroads, stepping out of an old and long-established lifestyle with no plans for the future. I have met others on the road who have something to go back to. Some have arranged time out from their job and will return to it when the trip is over. Others have a new job awaiting them, or at least a new vision of what to do. It doesn’t have to be a case of stepping into the abyss, although I have found the experience very cathartic and transforming. What is clear to me is that, whatever your personal circumstances, setting off on the open road to explore foreign lands, the wind in your face and your life packed into your panniers, will change you. I haven’t spoken to a single rider, either still on the road or having completed their trip, who hasn’t felt that the experience changed them for the better. Some I’ve met, who initially thought they were simply taking time out and would afterwards return to their ‘old’ lives, vowed that they were going home to make wholesale change. Travelling had given them a new perspective on things, a clearer vision of what they wanted out of life. For me, I can’t yet see the end of this trip. It is no longer a case of ‘time out’ for me. It’s become a lifestyle in its own right. I cannot imagine giving up the sense of freedom that being on the road creates. The constant change, not knowing what is round each corner, sharpens the senses and turns up the volume on life. And perhaps most significantly, I just love riding my moto along empty, twisting mountain tracks and through breath-taking landscapes. South America is a biker’s paradise. I offer these thoughts and observations for anyone who is feeling the call to travel, but as yet has not summoned the courage to make the jump. Tough decisions in life are usually the ones that offer the greatest reward. Life can sometimes feel like a supertanker – changing direction can feel impossible. But travelling can provide the open ocean needed to make that turn, free from obstacles and with time to find a new course. So embrace freedom, embrace the unknown, let go of the reins of life for once. Load up your moto and hit the open road.